arlos Hathcock was a country boy. Born in 1942, he was raised in the rural outskirts of Little Rock, Arkansas until his parents separated. After that, he moved down to Mississippi to live with his grandmother. At a young age, Hathcock took to hunting game in the woods near her home to help put food on the family table. At night, he would take his father's old service rifle from WWI and sneak out into the forest, pretending to stalk and shoot imaginary enemies. The day Hathcock turned 17-years-old, he enlisted in the Marine Corps. Three years later, he married his wife Jo Winstead on November 10, 1962 — the date of the Marine Corps birthday. All Hathcock ever dreamed of was going to war. Finally, he got his wish, and in 1966, his unit hit the ground in Vietnam. This time, there was a very real enemy lurking in the jungle. Before his deployment overseas, Hathcock had won several shooting competitions, including matches at Camp Perry, and the Wimbledon Cup. He began his service as a Military Police officer, until his sharpshooting ability caught the attention of Captain Edward James Land, who was pushing for Marines to add snipers to every platoon. Captain Land recruited Hathcock into sniper training, where he quickly proved himself to be an excellent marksman. Hathcock had 93 confirmed kills during the Vietnam conflict, but since confirmation had to be established through a third-party officer, and many of the shootings took place on solo missions behind enemy lines, 93 is thought to be much lower than his actual kill count. Hathcock estimated that he killed roughly 300 NVA soldiers during his time in Vietnam. 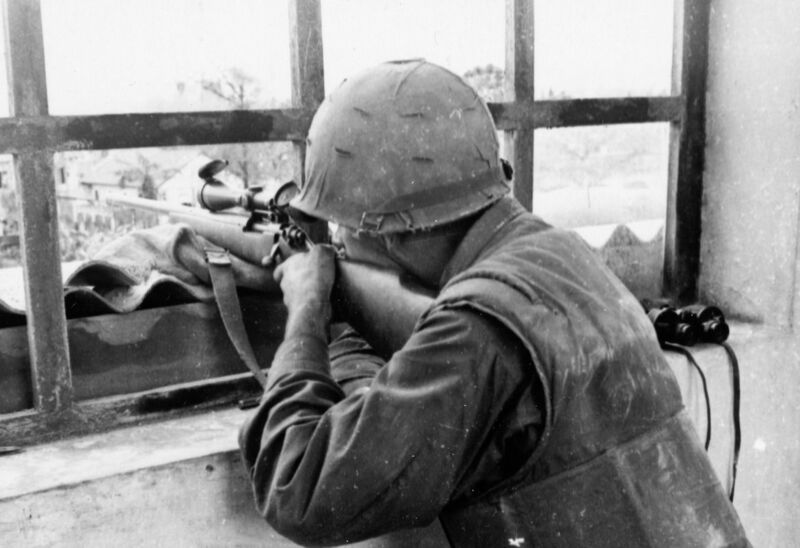 The NVA frequently put bounties on the heads of American snipers operating in the conflict. These generally ranged anywhere from $8 to $2,000. Hathcock was so deadly that the NVA placed a $30,000 bounty on his head. Hathcock held the highest bounty throughout the Vietnam war, and single-handedly killed every NVA marksman who sought to claim it. The Vietcong took to calling Hathcock "Lông Trắng," which means, "White Feather," because of the long white feather he kept in the band of his bush hat. The white feather became such an iconic symbol, that many Marines took it upon themselves to also wear white feathers, hoping to deceive the enemy and draw counter-sniper fire away from Hathcock. Hathcock is credited with several accomplishments throughout his service, one of the most notable of which was killing an NVA soldier by shooting a bullet through their rifle scope. Hathcock and his spotter were stalking an enemy sniper deep in the jungle near Hill 55, when Hathcock saw a dim flash of light reflecting off the glass of the enemy's scope. Hathcock lined up his shot, held his breath, and fired. When they approached the fallen soldier, they realized that the only way the shot could have passed through his scope was if the enemy soldier was lining up a kill shot at precisely the same moment that Hathcock was. Hathcock had managed to pull the trigger just seconds before he would have been killed himself. As incredible a feat as that shot was, the mission that would come to define Hathcock's career, was one that he would undertake completely on his own. athcock only removed the white feather from his hat once during his entire tour, and it was to carry out the most dangerous assignment of his military career. When asked if he would be willing to volunteer for a solo mission targeting a high-ranking NVA general, he accepted before hearing any of the details. Those details, as it would turn out, involved crawling more than 1,500 yards inch-by-inch through heavily guarded enemy jungle, painstakingly timing his incremental movements with wind rustling the grass around his hidden position. It took Hathcock four days and three nights without sleep or food to reach a suitable shooting position. As it neared sunset, he lay completely motionless and camoflauged as a patrolling footsoldier nearly stepped on top of him as he passed by. At one point a venomous Bamboo Viper slid inches from his face, and he had to struggle to retain the presence of mind not to move and reveal his position. When the target finally exited his tent that night, Hathcock took aim, held his breath, and squeezed the trigger. The target now taken out, the mission was still far from over. Hathcock had to crawl back the way he came, through territory now swarming with enemy soldiers on high alert and searching for him. Hathcock made it out unscathed and returned home after the mission was complete. He later regretted taking the shot, as the NVA stepped up attacks on American bases in retaliation for the killing, leading to massive U.S. casualties that he felt partially responsible for provoking. Following his discharge, Hathcock had a difficult time re-adjusting to civilian life, and returned to the Marine Corps in 1969 where he was re-deployed to Vietnam and placed in command of a platoon. Hathcock's sniper career was cut short when the LVT-5 he was riding on just North of LZ Baldy was struck by an anti-tank mine submerged underwater. Hathcock was knocked unconcious by the blast, but awoke in time to drag seven Marines from the flame-engulfed vehicle. Hathcock received severe burns during the rescue which left him in constant pain, hampering his abilities as a sharpshooter. Hathcock went on to help establish the Marine Corps Sniper School and served as an instructor there. He often said that his incredible shooting prowess was a result of being able to "get into the bubble" and focus solely on the task at hand, something that kept him alive in overwhelming and dangerous situations. Hathcock copied Hemingway's words on a piece of paper, and committed it to memory. "He got that right," Hathcock admitted, "it was the hunt, not the killing. I like shooting, and I love hunting. But I never did enjoy killing anybody. It's my job. If I don't get those bastards, then they're gonna kill a lot of these kids dressed up like Marines. That's the way I look at it." Images ©: 1. 1st Marine Division, Combat Photographer; 2, 3, 4, 8, 9. National Archives — USMC; 5. S.M. Leighty — USMC; 6. Mike Perry — SOFREP; 7. Walt Sides — USMC. Thomas McDermott is an Editorial Assistant at Huckberry. A Boston native, he recently graduated from Elon University, and currently resides in San Francisco.